Is it a bird feeder? Or...what is it? 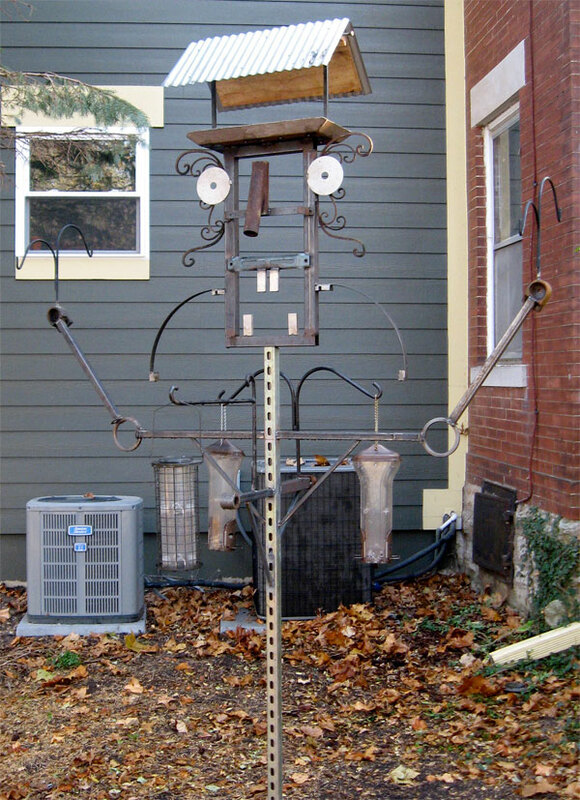 Today, I finished installing a large bird feeder sculpture. At first it was going to a robot, but now it looks more like an imposing metal scarecrow. Regardless, I think the birds will love visiting it this winter. The structure is outfitted with multiple arms and hangers. Great for hanging a variety of feeders. The top of the sculpture is a capped with a feeding tray which is protected by a roof. This entire piece is made from scrap and found objects. The sculpture towers over the yard, at more than 10 feet tall. Do you think this is high enough to keep the squirrels away? Probably not.